My zucchini are really pushing out the fruit-enough to feed the two of us and give out 2 each to 4 people/week- should slow up, though- leaf miners are getting in. 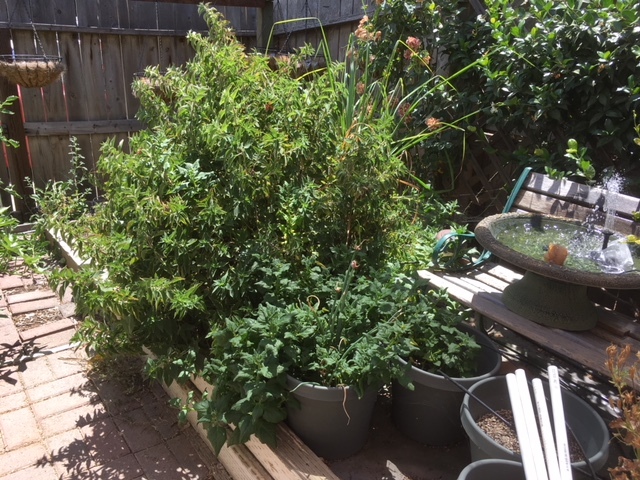 Have to keep up with the Neem oil sprays, and keep my fingers crossed that the powdery mildew and aphids don't get going. the beans are up, but not blossoming yet and I think that there are cut worms hanging around biting off the stems leaving a stalk and no leaves The beets and radishes are coming along, but the leaf miners are a curse on the beets. 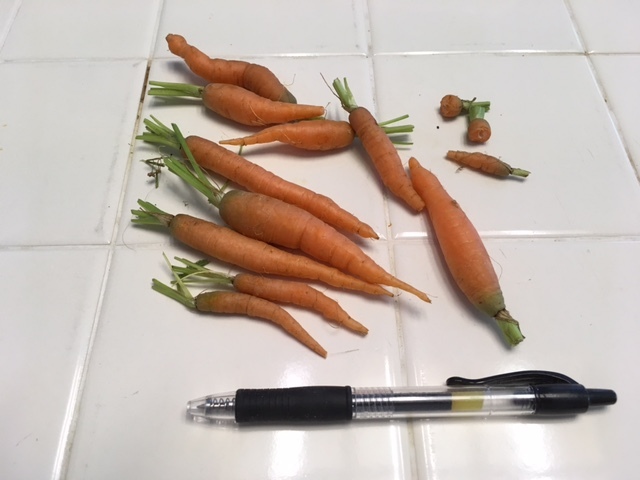 Thinning out the carrots and finding they would catch a fine sum at one of those foofie restaurants that like serving Foodies portions that you need a magnifying glass to find the food. @Yardslave wrote: Thinning out the carrots and finding they would catch a fine sum at one of those foofie restaurants that like serving Foodies portions that you need a magnifying glass to find the food. 2016 harvest. Side dish special: "Organic baby carrots $5.99"
I've been munching on those, too. YUMMY! It's appropriate for July 1 that I post melon photos. The first was taken at night. 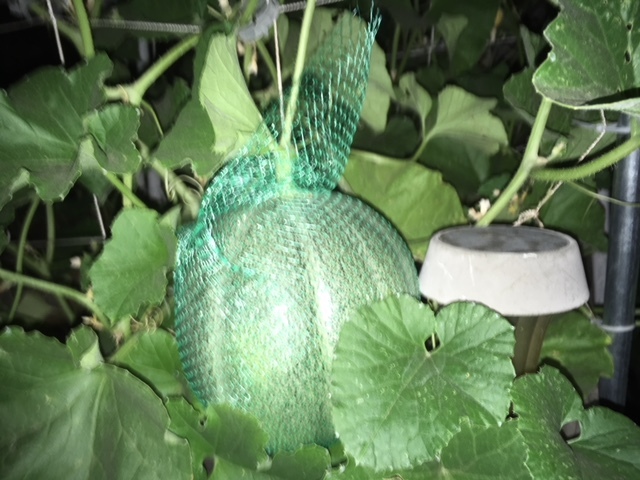 This Petit Gris has on its new protective produce mesh coat. Two other varieties, one probably a Hales. They meander back and forth among the trellises, totally ignoring my labels. Sweet melons. They are too small for the mesh sleeves. 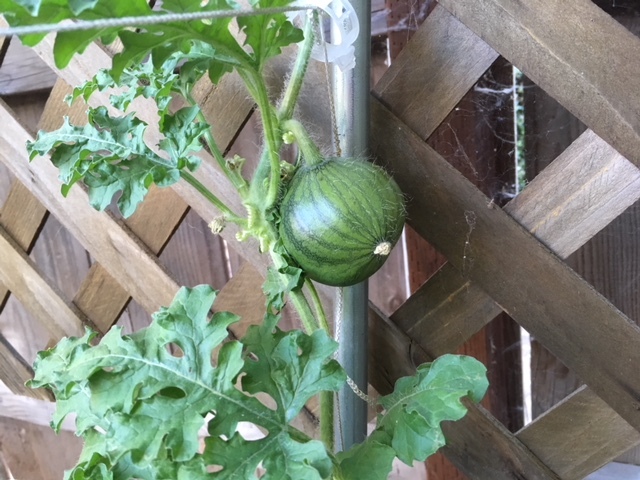 Watermelon, a little misshapen probably due to incomplete pollination. This is the 6th summer for SFG and I finally got around to selecting a solar powered water pump and bird bath. The pollinators, bumble bee, bees and wasps, follow me when I water the garden. 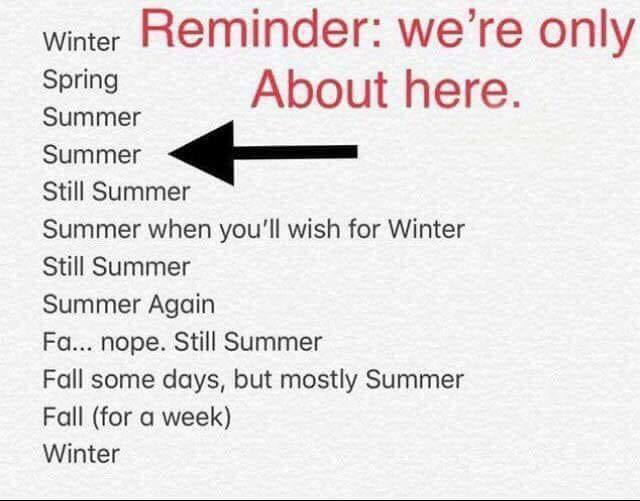 I'm sure there are folks in AZ, NM, TX and other areas that feel the same. @sanderson wrote: I'm sure there are folks in AZ, NM, TX and other areas that feel the same. Big score at the Farmer's market tonight. When the temps are in the 100s, the produce just doesn't last. 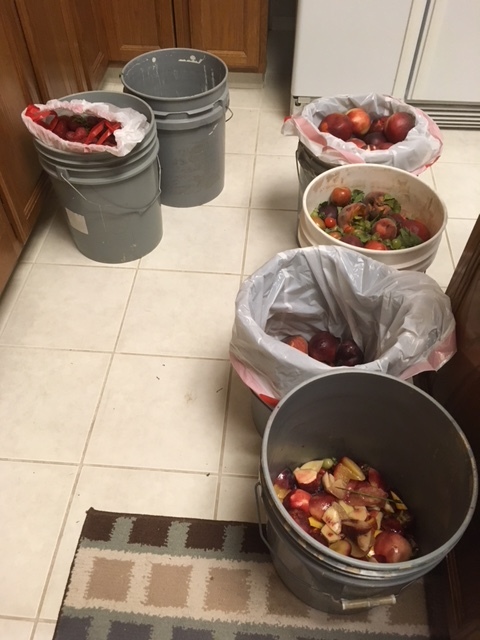 I still have 3 buckets to chop but I'm too pooped so I will do it in the morning. 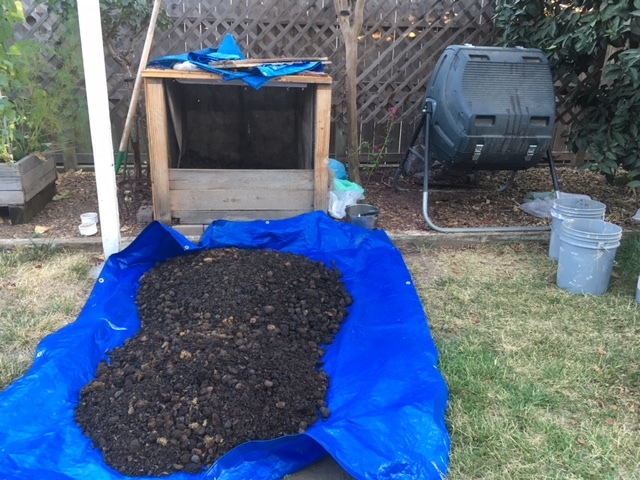 It's time to build another 80-gallon tumbler pile for composting. Three (3) more buckets to go. 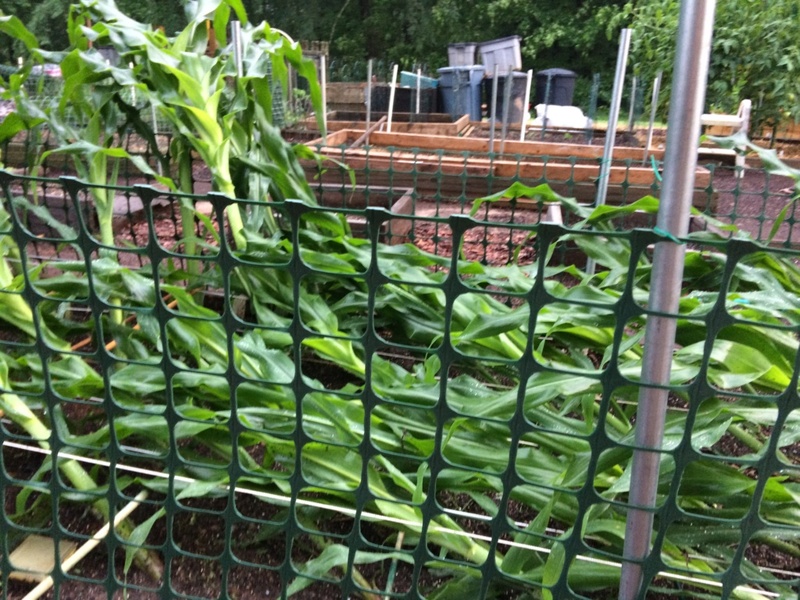 The corn has not fallen over with the new frame with trellis netting. However, it's all caught up in the trellis so I will have to cut the zip ties and free it. Then secure it so the ears and tassels (growing) can socialize. Your corn looks nice and green and healthy. Next year maybe just some ropes/string down the side instead of the netting.????????????????????? Corn!!! Why does it need support? @Scorpio Rising wrote: Corn!!! Why does it need support? This is why. It can get blown over by a nice thunderstorm. We are using Mel's Mix which is very light. Easy to pull weeds but not strong enough to hold up corn from being blown over with the wind. Also, it is difficult to pull dirt up around the bottom of the stalk because of intensely planting. Probably some other differences between growing corn in SFG and farmers growing corn out in a field. If it is supported in some way, it can withstand a lot of wind. 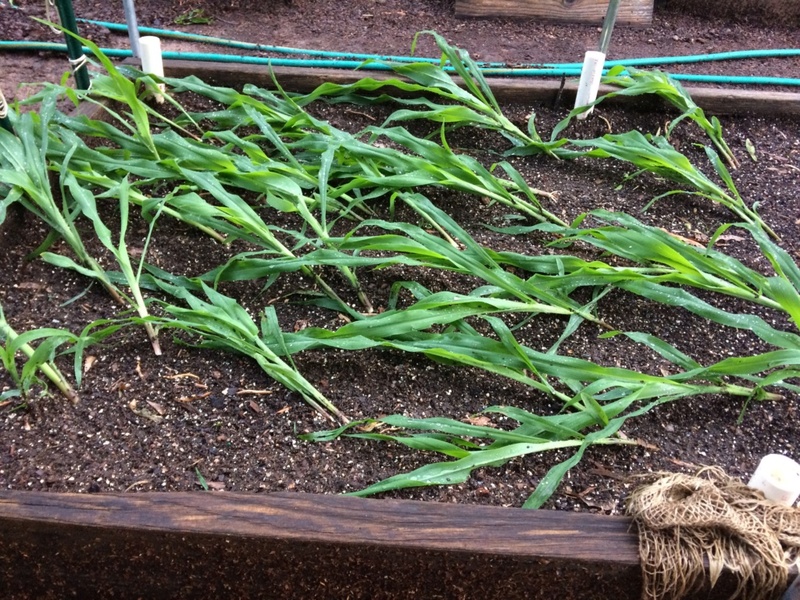 This bed now has supports all around the stalks and the corn survived the last thunderstorm. I managed to get the front row freed from the netting. The back row will have to wait a day or two. New compost started in the tumbler with the produce score from Friday night. Mowed leaves and Starbucks added. Tomorrow I may have to chop some bedding straw for more volume. 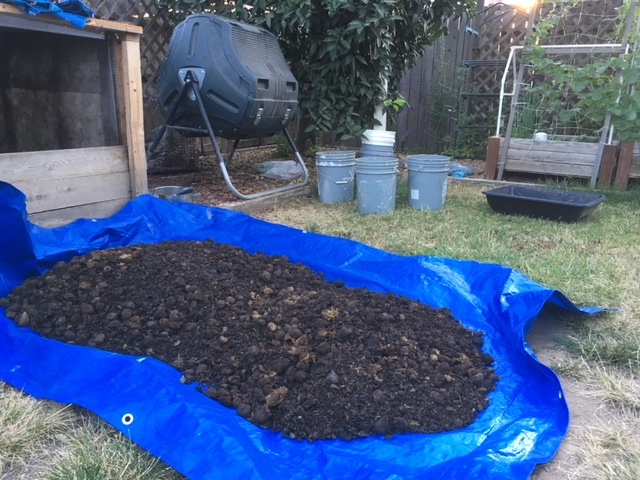 The compost on the blue tarp is heavenly. Yes, there are still horse droppings but they are pasteurized and smell totally earthy. The red wigglers love them. For anyone familiar with the Lifetime tumbler, yes it is not in the neutral position. I'm turning and locking into different positions to let the juices trickle through the dry leaves. Only then will I water if needed. I've learned not to over water the tumbler like I could do with the bin. Wow, Sanders - that is some beautiful compost! Thank you. I am really pleased with this batch. The new one in the tumbler has not gotten above 115*F. ?? I've been playing Nurse Ratchett for Ken after his shoulder surgery Tuesday morning so I've been sporadic on this Forum. Boy, that is one painful surgery, even with just three little holes. Hot, just plain hot. The cotton is growing, along with the one soy bean that sprouted. The corn is 7' and taller. But, instead of ears and silks popping out, there are clusters of leaves. 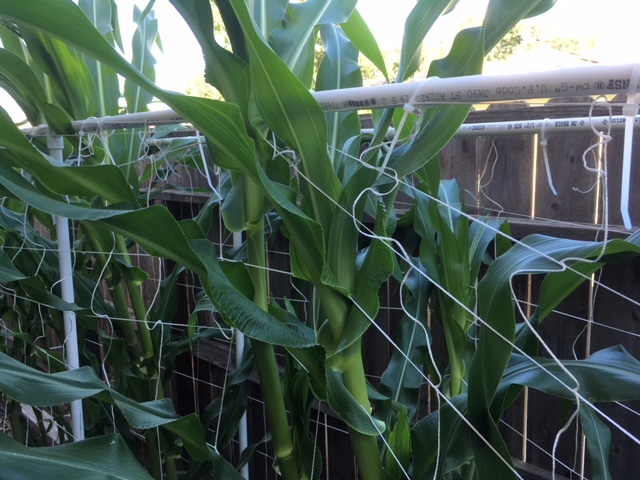 I was able to free up the leaves and tassels caught in the trellis netting. There are plants in just 4 of these pots. Lemon grass started 3 years ago, Pineapple Sage started 4 summers ago, New Zealand spinach (this spring), and walking onions (2 summers ago). The sage and NZ spinach fill up the half of this area. I'll get that bird bath level if it kills me. I tried a shim, now it leans a different direction. Shoulder surgery -- OUCH! Garden's looking good. Hot is right. Bob got heat exhaustion, waiting out in the 107-110 heat, waiting for a delivery truck that never came. Now I have to watch him like a hawk and not let him out without a neck cooling towel and definitely not after it hits triple digits. Yes, tell him to cool it! 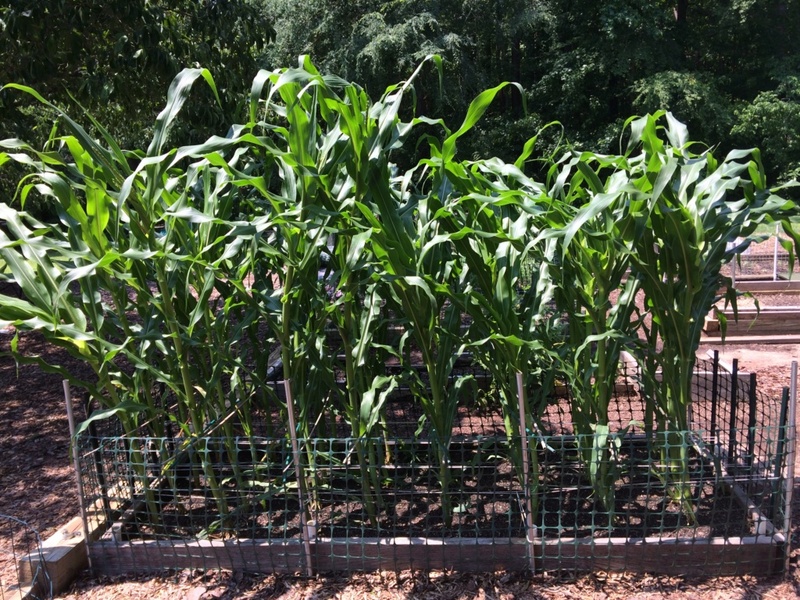 106*F but the humidity has dropped so it only feels like 106*F.
The SQ corn finally put out some ears with silks. It's about 9 feet tall, or an elephant's eye. I'm sorry there are no photos or exciting news. Same hot weather here, but with a twist- coastal fog settles in at night and temps drop by 40 degrees. 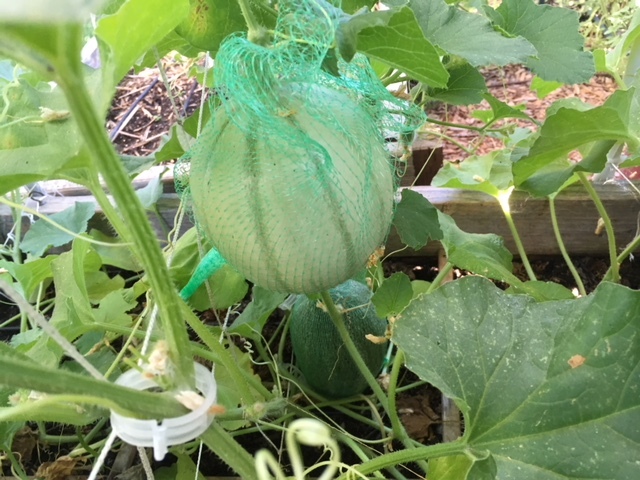 It's been a challenge to keep up with the watering, but so far, no droopy squash plants. The Tomatoes are setting fruit, but not at a high rate due to the heat, and ripening is slow due to the cold nights. With the intense heat, the beans are showing some signs of leaf burning when I can't get enough water on them, but they are climbing and showing some blossoms. 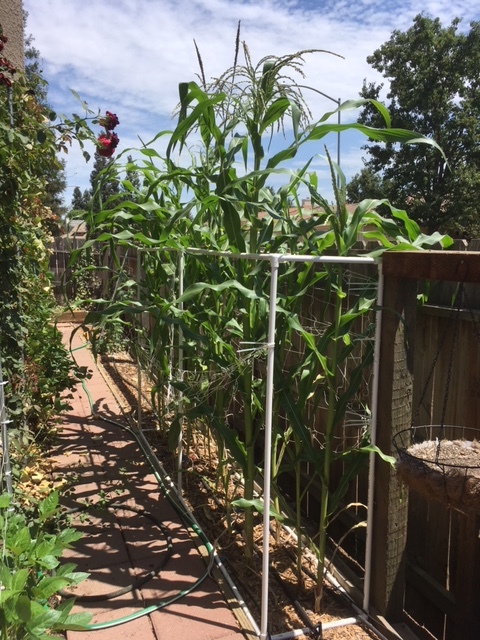 The thing that has been bothering me is that I planted beans that were supposed to be bush varieties, but turns out I planted Blue Lake pole beans from a mismarked pack, so I had to put up tripod pole arrangements to accommodate the climbers. 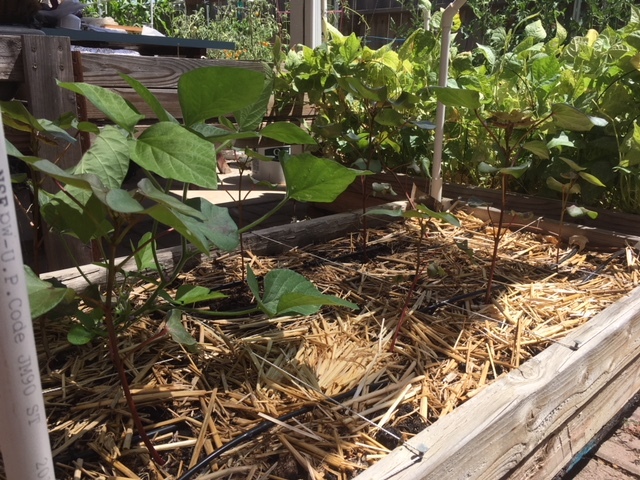 half the bed is Kentucky Wonder bush variety that won't need trellising, so the outside plants on the 4 corners of the square are pole beans and the center "cross" plantings are bush- it will make it hard to get at the center of the patch with the pole beans in the way. Oh well, I'll have beans no matter what, and my dog is always willing to help find a few bean pods for herself to snack on. I didn't realize that the coastal fog reached all the way to Carmel Valley. Have you posted a photo of you garden buddy under PETS: Garden Doggies? I thought we had a cloudy overcast, today. I kept waiting for a little thunderstorm. Then I found out it was a smoke blanket over the Valley. It was 108*F and smokey. 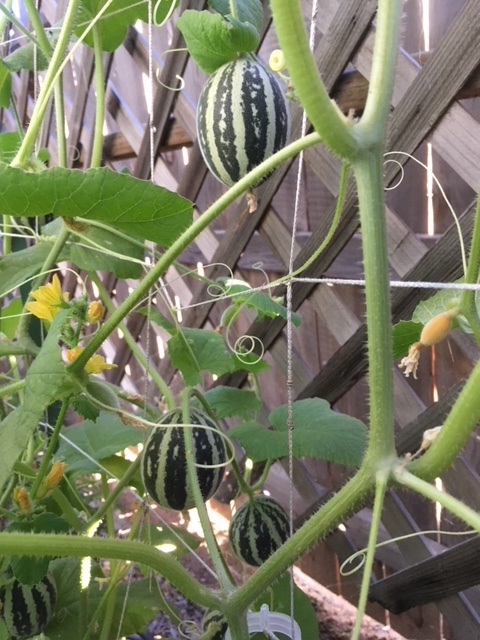 Nothing is setting, but fruit that set before the heat, are ripening nicely. Super excited to finally have some decent tomatoes of varieties that are hard to grow here. Cherokee Purple, Rutger, Mortgage Lifter, and Arkansas Traveler. 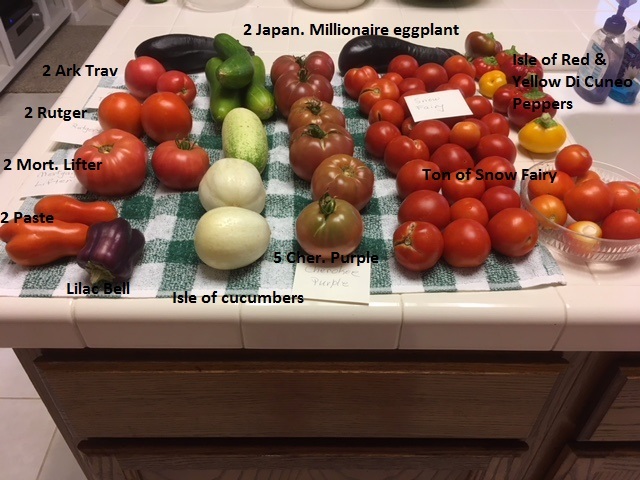 The reliable Snow Fairy tomatoes, which are the first to set and ripen, have done very well. 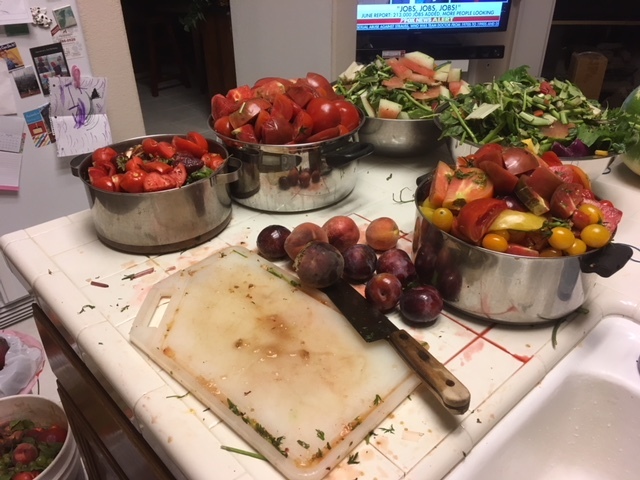 I will prep them for the freezer for canned tomatoes later in the season. I proudly present Sanderson's first exotic tomato harvest. S, good to see that all that hard work in the garden is paying off. @Yardslave wrote: S, good to see that all that hard work in the garden is paying off. I notice there are Heat Warnings through Thursday in many areas of CA. Stay cool and I hope everyone's plants make it. In Fresno, we were warned that black outs are possible.